Grills are a great addition to the cooking range present in any household. They can be used at parties, family gatherings and even just a Sunday morning. They provide a great taste to the food that is cooked on the grill. One of the significant concerns that chefs and people generally have with a grill is the problem of cleaning it properly. There are several ways to clean the grill that are usually present in the instruction manual of the grill. Although these ways are many, not all of them are very effective. We have included some information in this post on how to clean a Blackstone flat top grill. So, before we move on to the actual tips on how to clean the Blackstone flat top grill, we feel that it is essential for you to know how often you should clean the grill. It is highly recommended that you mildly clean the grill before use and thoroughly clean the grill after use. It will help fend off any pesky fats that remain on the grill or griddle top after use. It also helps to remove any smell that can develop and make the food stink. You should also consider cleaning your grill after every three weeks if you do not use them regularly. The grill is the best place for bacteria to develop and molds to flourish. How can I optimize cleanliness? The best way to make sure that the cleanliness is optimum is to use a lid or cover for the grill. It prevents the griddle from accumulating any unnecessary dust or grease from the environment. It also helps to eliminate the chances of any insects or animals making the griddle their home. The lids also prevent bacteria from developing inside of the skillet as it hinders their growth due to the inhibition of excess moisture from the air. What other precaution can I take? One of the most basic precautions which you can take is to check for propane or gas leaks in your grills regularly. These can cause a considerable hazard, and they are also a source of danger for the environment as well as yourself. Once in a fortnight, spread soapy water on the pipes carrying propane or methane. Use an old toothbrush to do this so that the water gets into the tight spots too. If there are any leaks, then you should see bubbles rising. If that is the case, then you should consider tightening the connection. More of the propane tank storing here. How to clean the Blackstone flat top grill? Like we said before, there are several ways in which you can efficiently clean the Blackstone flat top grill. Let us explore the several ways which are available to us and the pros and cons of each method. The grates are an essential part of the grill because it is where you place the protein or vegetables to be grilled. A lot of the times, some juices or fat gets left over on the grates, and people forget to get them off at the right time. It results in a grill that is highly greasy. One way to get this grease off is to use a hard copper brush and scrub the grates until all the fat gets removed from the grates. To ensure you got all of it off, turn the grates over and see if there is any remaining fat left on the grates. If there are any, then you scrub them off. It is advisable to use soapy water to soften the fat first. The burner protectors are present in the grill to prevent the burners from getting clogged with dust, dirt or grease. Naturally, these protectors get very dirty very quickly. Usually, there’s a latch that can be pulled and these protectors come off. Once these protectors are off, all you need to do is soak them in soapy water and scrub them with a sponge. It will help remove all the grease and they will look new as before. Metal starts to rust soon since the top of the skillet is mostly made from iron. The problem here is that the rust makes it difficult to prevent any flakes from falling into the skillet. 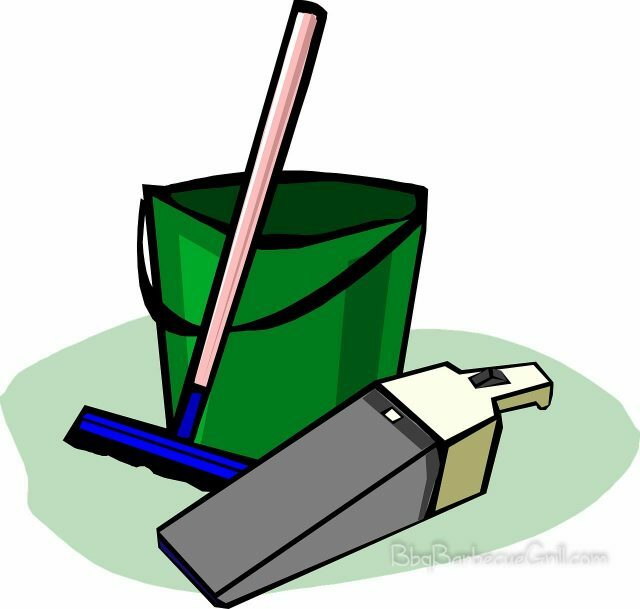 The best way to clean this is to use your Blackstone cleaning kit which is provided with the Blackstone grill. You should heat up the grill so that the rust loosens and is then easy to get off. You should use some heat resistant gloves present in the kit to clean the rust on top of the grill. Drop a few drops of oil and liquid soap on the top and then scrub using a grill stone. However, if there is no grill stone available, you can substitute it by using sandpaper. Sanding the top of the grill will also help remove any minute traces of rust on the top. Another way to properly clean all the grates is to use a solution of vinegar and water. It will enable you to clean the greasy grates. For this, you can mix vinegar with water. Then apply this solution to the top of the Blackstone flat top grill. You can then scrub the top using a sponge which will effectively wash off all the grease present on the top. The bottom side of the grill is where all of the grime ends up. It is most definitely the most challenging part of the grill to clean up. 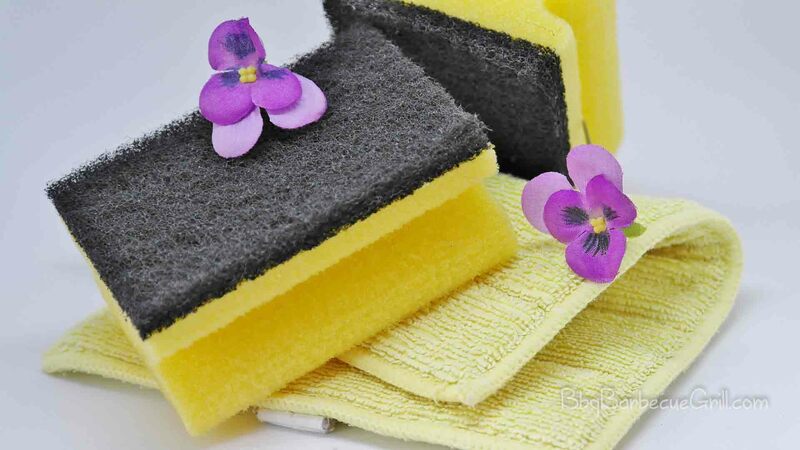 Mainly because the gunk is being accumulated at the bottom is sticky and difficult to get off using a sponge. In most griddles and grills, there are usually two trays at the bottom of the grill. It is critical to note here that you need to only worry about getting the char and gunk off the plate. It can stick onto the tray in a very persistent matter. 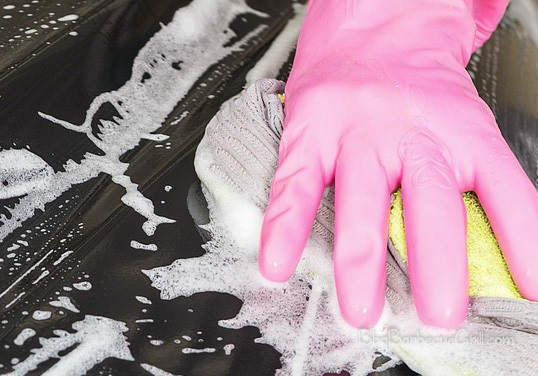 A sponge and soapy water will not help you much in getting rid of the gunk. However, it doesn’t matter much, and you only need to be cautious of the big pieces of char and grease that have accumulated on these trays. You need to scrape them off using a grill brush. The grills are a complete package for the summer evenings. You can also use them on Sunday mornings as they are a part of the American culture. Of course, to continue enjoying the taste that it offers, it is essential to keep the grill neat and tidy. We think this information will assist you in maintaining a hazard-free environment and a clean cooking environment.